Jephthah offers up is daughter. Jephthah (Heb./Aram. יפתח Yiftach/Yipthaχ) is a character in the Old Testament who served as one of the judges in Israel for a period of six years (Judges 12:7) between the Israelite conquest of Canaan and the first king of Israel, Saul. Jephthah lived in Gilead and was a member of the Tribe of Manasseh. His father's name is also given as Gilead. Unknown outside of the Bible, Jephthah is remarkable for several reasons. First, his birth was anything but a noble one, being identified as the son of a harlot. Second, despite being driven from home by his half-brothers, Jephthah went on to be a great military leader, to whom God gave impressive victories against the Ammonites. Third, Jephthah tragically fulfilled his vow to God to sacrifice "whatever comes out of my house first" by slaying his own daughter as a burnt offering to God. The story of Jephthah thus ends as an extremely disturbing one, providing evidence of Israelite human sacrifice in the time of the judges—not to a false God but to the God of Israel Himself. Jephthah's saga provides a shocking counterpart to the much better known story of Abraham's binding of Isaac, which culminates with God intervening to spare Isaac at the last moment. The story of Jephthah begins with a description of the plight of the Israelites who live east of the Jordan River. For 18 years, the Book of Judges reports, the Israelites in the land of Gilead were harassed by neighboring tribes, especially the Ammonites, who also made forays west of the Jordan to cause "great distress" to the major tribes of Israel. This prompted the people to pray to God in repentance, which resulted in the emergence of Jephthah as their deliverer. The Return of Jephthah, by Giovanni Antonio Pellegrini. Jephthah was his father's son by a prostitute. His half brothers—sons by their father's legitimate wife—were consequently unwilling to share their inheritance with a son of "another woman." Being driven out by his siblings, Jephthah took up dwelling in Tob, east of Gilead. Here, men identified as "adventurers" joined him in opposing the Ammonites and put themselves under his command. (Judges 11:3) Later, the Ammonites attack Israel again and the "elders of Gilead" ask Jephthah to aid them. They apparently include some of his kin, and he balks at first, on the grounds that they had driven him from his home. They persist in requesting his aid however, and he eventually agrees to help, after they promise to make them their permanent leader if he prevails over the Ammonites. At the shrine at Mizpah, Jephthah makes a formal pledge before Yahweh to seal the agreement. Before going to war with the Ammonites, Jephthah sends messengers demanding to know the reason for their attacks. The Ammonite king replies that the Israelites had unjustly taken certain lands from them after the Exodus from Egypt. He agrees to end the attacks if the land is ceded back to his domain. Jephthah replies that the inhabitants of the land were given their chance previously, when the Israelites asked permission to pass through peacefully on their way to Canaan. Because a previous king did not trust the Israelite's promise, Jephthah says, Yahweh gave the lands in question to Israel. They cannot now be given back without a fight. Jephthah's daughter greets him upon his victorious return. God responds by giving Jephthah a great victory, in which he conquers 20 Ammonite towns and wins the war for Israel. Here, however, the story takes a tragic turn. Returning home in triumph to Mizpah, "who should come out to meet him but his daughter, dancing to the sound of tambourines!" The text explains that she is his only children, and he declares: "Oh! My daughter! You have made me miserable and wretched, because I have made a vow to the Lord that I cannot break." The virgin girl, with unquestioning faith, agrees to comply with his vow. "Grant me this one request," she says. "Give me two months to roam the hills and weep with my friends, because I will never marry." 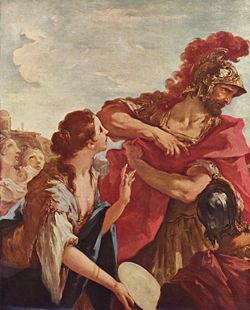 After the two months are over, Jephthah carries out his vow. No angel appears to stay his hand, as it reportedly did for Abraham with Isaac so many years previously. The narrative concludes with a report that, "from this comes the Israelite custom that each year the young women of Israel go out for four days to commemorate the daughter of Jephthah the Gileadite." This remarkable young woman is not given a name other than "daughter of Jephtah." Later, the men of the tribe of Ephraim object that they have not been allowed to share in the war—and presumably the plunder—against Ammon. They confront Jephthah and refuse to recognize his leadership. Apparently God is still on Jephthah's side, for he prevails against Ephraimites. The story is remembered especially for the episode in which Jephthah's forces were able to identify their enemies by their accent, as they said the Hebrew word shibboleth as sibboleth. For rebellion against the Jephthah, 42,000 Ephraimites lost their lives (Judges 12:5,6). 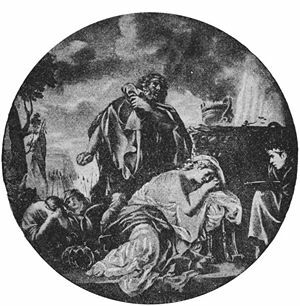 The sacrifice of Jephthah's innocent daughter has been the subject of many debates among readers. Some have argued that this was a practice of dedicating women to virginity—that the young woman was not actually killed—but the text is clear that he really sacrificed her as an offering. 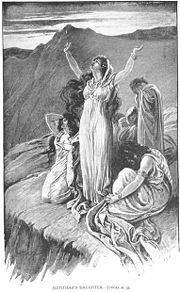 Ancient Jewish writers interpreted it as a human sacrifice, as seen explicitly, for example, in the classical Pseudo-Philo, where Jephthah's daughter sings a lament about her impending death and its necessity to fulfil Jephthah's vow. Some Jewish sources claim that Jephthah may have expected an animal such as a dog to greet him upon returning home. Alternatively, the main point of this story may be to instruct young girls as to how to behave should they ever be selected for service (verses 37-38). That is, it could be a normative tale. 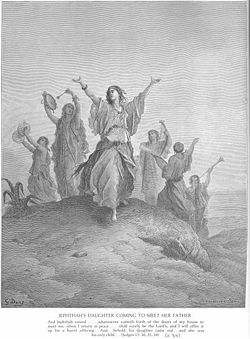 Whatever the case, it became a custom in Israel (perhaps only in the region of Gilead) that women should go out four days every year and lament the daughter of Jephthah. This custom is still practiced by certain Israeli women during the last four days of Spring (in the month of Khordad), just before the summer solstice. Despite his victorious and the biblical statement that he was inspired by the Holy Spirit, Jephthah is often represented by the rabbis as an insignificant or foolish person. He is classed with the fools who made imprudent vows (Eccl. R. 4.7, Gen. R. 60.3). According to some commentators, Jephthah did not slay his daughter, but only kept her in seclusion. The majority view of the ancient rabbis, however, is that Jephthah indeed immolated his daughter on the altar, which is regarded as a criminal act. In this view, he might have applied to high priest to absolve him from his vow. The rabbis also concluded that Jephthah was an ignorant man, else he would have known that a vow of that kind is not valid. According to Rabbi Johanan, Jephthah had merely to pay a certain sum to the sacred treasury of the Temple in order to be freed from the vow. According to Rabbi Simeon ben Lakish, he was free even without such a payment. "They have built the high places of Topheth in the Valley of Ben Hinnom to burn their sons and daughters in the fire—something I did not command, nor did it enter my mind." While the Valley of Ben Hinnom is traditionally believed to be a place of pagan sacrifice, Jeremiah clearly needs to convince his audience that God does not require such acts. Indeed, while the story of Abraham and Isaac takes place before the story of Jephthah and his daughter, it may be the case that the stories were written in reverse order, in which case the story of Isaac may have been promulgated to counteract the idea that God inspired Jephthah to make his infamous vow. In any case, the story of Isaac's sacrifice, where God saves the child after demanding that the father slay him, seems the exact reverse of the story of Jephthah's daughter, where the father vows to make a similar sacrifice while under the inspiration of the Holy Spirit. Some scholars have suggested that in the evolution of the Israelite religion, human sacrifice to Yahweh was not uncommon. In this view, the Israelite practice of redeeming first born sons making offerings at the Temple of Jerusalem may have evolved out of an earlier tradition in which parents were once expected to sacrifice their first born children to God. Later, the Israelites would make their refusal to engage in such practices a hallmark of their religion, in opposition to the Canaanite traditions out of which their faith had evolved. This page was last modified on 30 April 2008, at 18:32.